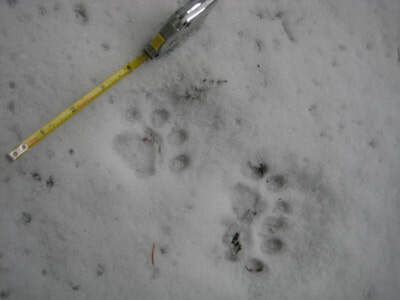 Learn animal tracking, enjoy group snowshoe trips, and help survey for rare carnivores on Mt Hood. Trained volunteer trip leaders lead survey groups to Mt Hood almost every weekend from mid December through the end of March. 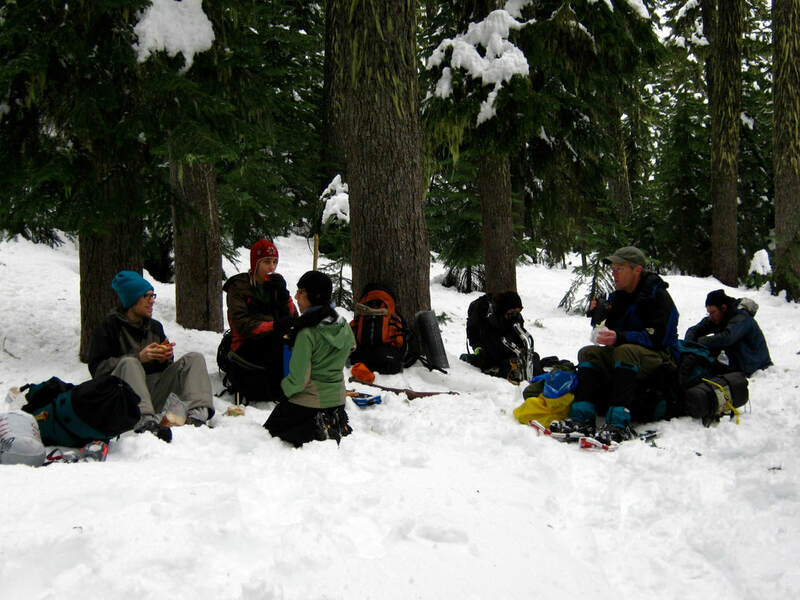 Trips are done on snowshoes in groups of up to 10 people. These surveys provide a place for new and experienced trackers alike to strengthen their skills, get together with like minded people, and participate in a long-term survey to detect signs of rare forest carnivores. Even if you are new to tracking, your observations are a big help, providing more eyes and more brain power to help find tracks. We ask that you help out on at least two survey trips during the season, and you may come on as many as you like. If you already attended the training in a previous year, simply contact us to register and get the password to sign up for trips. We highly encourage returning people to renew your membership with Cascadia Wild to help support the project. Your membership helps pay for the cost of running the program. Become a Trip Leader. Our volunteer trip leaders are the backbone of this project. If you are ready to dive into animal tracking and want to help lead trips, we can provide the training through an 7-month Naturalist Training Program. If you already have tracking skills, contact us about leading trips - we would love to have you help out! Everyone is welcome to participate, no experience is necessary. However, you must be in good enough physical condition to snowshoe up to 2 miles. This is the equivalent of hiking around 5 miles. If you have never been on snowshoes before, be aware that it uses different muscles than you might be used to! Most wild mammals are difficult to observe, even though they are all around us. Tracking provides a way to unravel their mystery. By interpreting the signs they leave behind, we can get clues about their presence and their activity. Learning animal tracking can open a whole new door to the natural world, helping you realize the many animal species living in the forest even though you can't observe them directly. Animal tracking is an ancient art. It can remind us of our ancient ancestors and how they relied on their connection to the natural world to survive. Although times are much different now, our health as a society and as individuals still depends on this connection to the natural world. 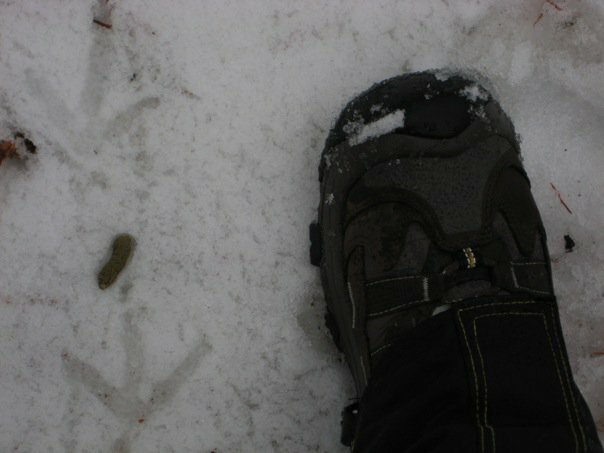 Snow tracking survey trips have two goals, to record data on animal species seen and to teach new participants about animal tracking, wildlife, and the natural world. In addition to teaching tracking, trip leaders also include other naturalist skills, such as wild edible plants, fire making, and awareness skills, to help you develop a connection with the natural world. We teach a unique blend of science and participatory interaction with nature, with a goal of increase people's appreciation of how everything is ultimately connected to everything else, and through this, to help people develop healthier relationships with the natural environment and with their community. The more you study tracking, the more you realize that everything, in fact, leaves a track of some sort. Each outing provides a new lesson in animal tracking, as different animals pass by and snow conditions change - we can never predict what we will see, so the day is always full of unexpected adventure!